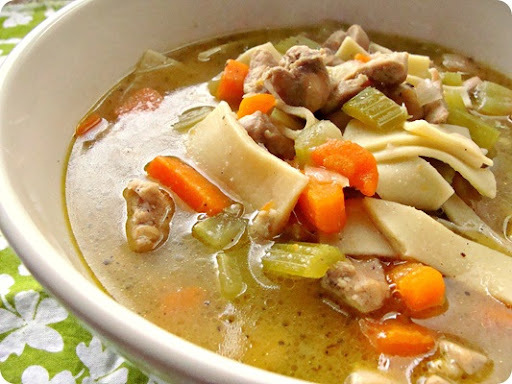 We have all been feeling under the weather in our house the past week and I thought a big batch of healing chicken noodle soup was in order! 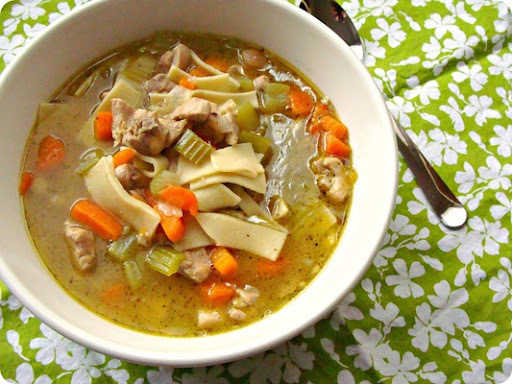 My son LOVES my homemade chicken noodle soup… and well, so do I! 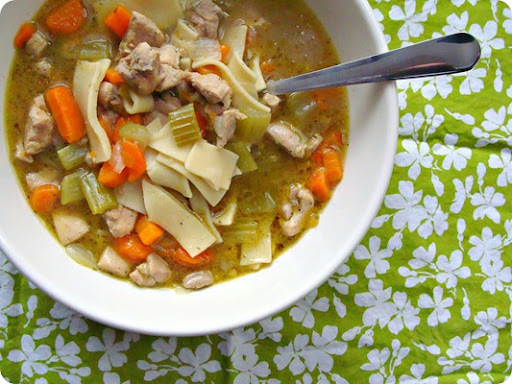 Fresh veggies, juicy chicken and comforting broth – this will cure any sniffles in no time! I used boneless chicken thighs, fresh thyme and gluten free noodles. You can use chicken breasts and regular noodles, but this is what I had on hand! You can use fresh thyme sprigs or poultry seasoning, I like the different herbs in poultry seasoning but I really enjoy using fresh herbs. Add as many veggies as you like. If you like a lot of carrots then add more – it will only help the flavor! Pre-cook your chicken in the same pot you are going to cook your soup in. Add a few teaspoons of olive oil to the bottom of the pan and add your chicken pieces. Add a pinch of salt and pepper and let it cook through entirely. Once the chicken is cooked, add the celery, onion, carrots and garlic. Stir until softened but not brown (about 10 minutes). Add a pinch more salt and pepper to taste and your poultry seasoning, if you are using, or your fresh herbs. You can always add more as the soup cooks so go easy at first. 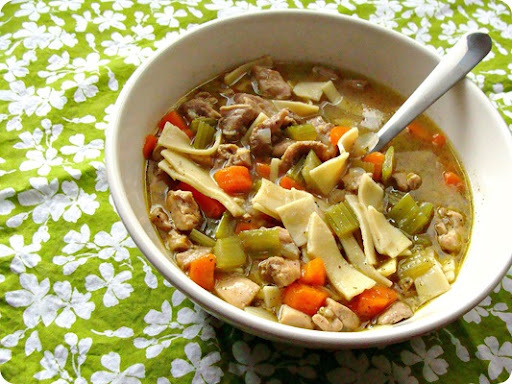 Add the chicken broth or liquid – I used organic, free range chicken broth. Bring to a boil. Cover and let cook until the vegetables are slightly cooked through. Add the fresh noodles and let simmer for 5-10 minutes. The noodles will continue to cook even once you take the soup off of the heat. They cook fast so continue to watch them. You can garnish with fresh parsley leaves if desired.